Reading the work of an inspiring author can help us lift our playing to the next level. Key technique-building exercises as used by the great teachers and players – many of which have never been written down before. Basics exercises give immediate, concrete results. This classic book is full of good, sound, practical advice. It makes very worthwhile reading. It has great information on fingerboard geography including the Violin Fingerboard Map on my wall. Nurtured By Love is a collection of Dr. Suzuki’s thoughts on the ideas that guided his life and work. From short vignettes the reader learns about his discovery of the Mother Tongue Method, his views on talent and education, and his belief that, for great artists, high standards of art and high ethical standards for life are synonymous. In this sequel to Nurtured by Love, Dr. Suzuki states that “the fate of the child is in the hands of his parents.” With this book he shows how to create a warm environment which will encourage any child to become a happy, loving and talented human being. by Kato HavasA comprehensive and thorough book written by the former child prodigy. Each aspect of violin playing is broken down into tiny steps. A useful book for the beginner and advanced player alike. Contents include: the importance of good posture, range of motion and movement, how muscle memory is acquired. 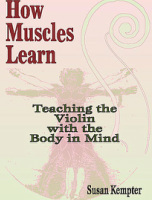 Each chapter includes helpful photographs illustrating techniques, helpful hints, exercises to practice the principles in each section, and musical examples. by Barry GreenOne of the best selling books of all time on musical performance, here’s a book designed to help musicians overcome obstacles, help improve concentration, and reduce nervousness, allowing them to reach new levels of performing excellence and musical artistry. by Robert GerleThis innovative, imaginative guide offers countless suggestions for creating joy and excitement in performance. A stimulating series of activities and reflections using YouTube video clips clearly illustrates ideas, concepts, and techniques such as breathing, pulse, and movement. by William and Constance StarrPractice, motivation, learning, competition and family lifestyles are a few of the topics discussed by these experienced teachers, performers, and parents.Treasured as a handbook by many Suzuki parents! by William StarrA comprehensive guide to the Suzuki violin literature. Widely used internationally by both teachers and parents. A new chapter called “Practice Can Be Fun” includes material from speeches the author has given to children, parents and teachers. There are stories on practicing which can be read to children.